The ZARPAX XL Multipack contains two ZARPAX XL+ bags, each with another more 10% weight than the standard XL model. Dampness, bad odour and bacteria spread isn’t a problem limited exclusively to small spaces. Excess moisture can build up in laundry rooms, garages, closets and pantries just as well. The Multipack will help you effectively eliminate the problem, removing musky scents and excess humidity. Utilising ZARPAX’s proven moisture-removal technology, the extra-large 2×500-gram pack is perfect for larger spaces that don’t receive sufficient ventilation. While excess moisture buildup is most common in smaller spaces, larger unventilated rooms such as laundry rooms, RVs and caravans are in the risk category as well. If left untreated, high humidity levels will create bad odours and damage furniture and wooden finishing. 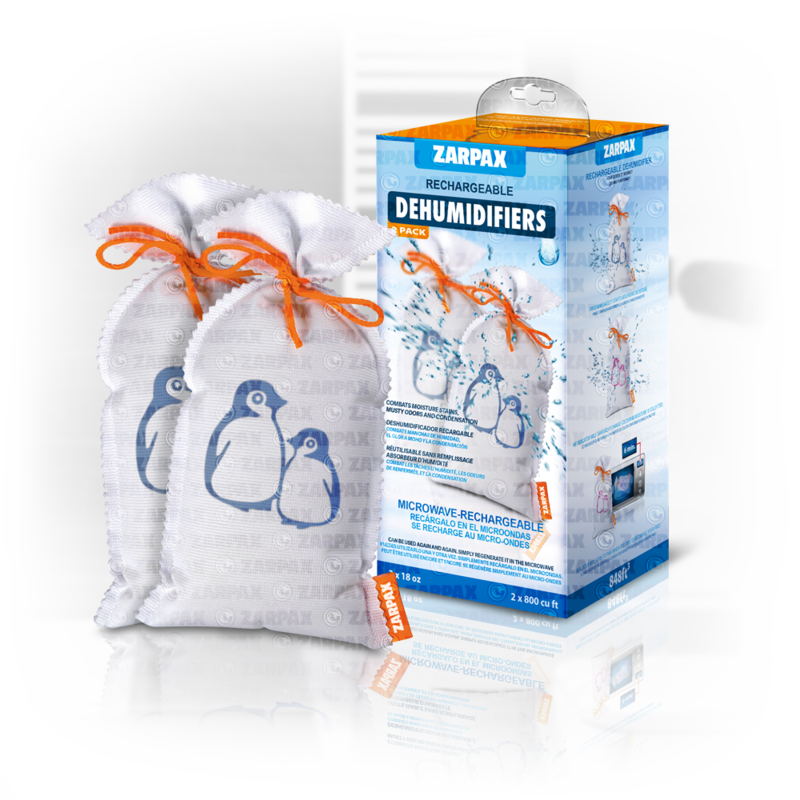 With our ZARPAX XL Multipack, you can rest assured, knowing that the moisture levels are kept at optimal levels, and the excess humidity is absorbed. 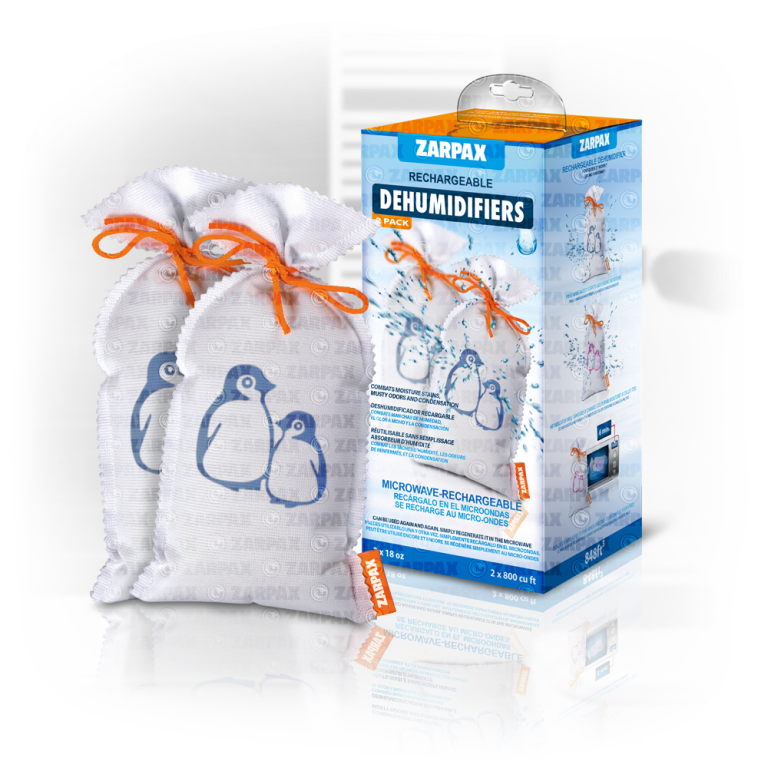 The 2×500-gram multipack utilizes ZARPAX’s innovative dehumidifying technology, and with the extra-large packaging the product’s capacity is greatly increased. Perfect for large, unventilated spaces, such as large closets, campers and laundry rooms, the ZARPAX Multipack will regulate humidity in places that are not checked regularly. Unlike chemical-based adsorbents, ZARPAX Reusable products are not used up, and do not require refills. Each bag will keep absorbing moisture until it’s fully saturated, but it will not leak or leave stains when it’s full. This minimizes the chance of corrosion and chemical stains damaging furniture and wooden finishing. ZARPAX’s smart reusable products are incredibly easy to use. Once you put them in place, they will automatically start absorbing excess humidity and bad odours. Each bag comes equipped with an innovative, humidity indicator, which will turn from blue to pink when the product is fully saturated. When that happens, just heat the bags in a microwave for 2 x 6 minutes each, and they’ll be ready for more action!